Mrs Bill, the cabinet with the distinctive “turned-up” corners on the door, is a smart solution both at home and in the conference room, reception area, office, etc. 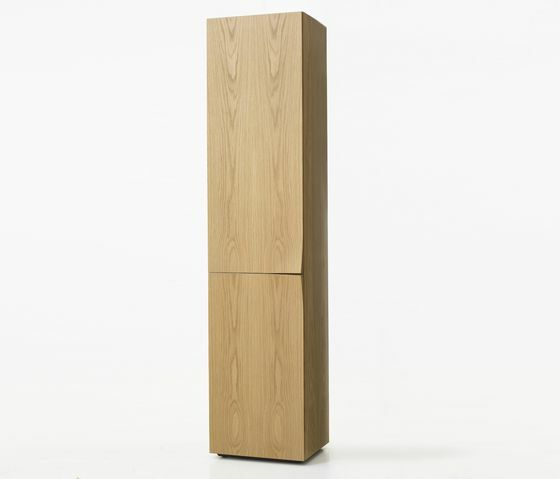 The 360 mm deep cabinet is available in 450 mm and 900 mm wide versions and in heights of 621, 835, 1197, 1620 and 1967 mm. The cabinet BI251BS is 1260 mm high including the underframe, which comes in brushed stainless steel or eight standard colours. The cabinet itself is a blockboard construction, veneered in oak, birch or walnut or finished in one of eight standard colours. When choosing a white lacquer finish, it is also possible, as an optional extra, to order a lacquered interior with green, pink or lilac shelves. Locks, pull-out file units, pull-out shelves and magazine shelves are available as accessories. Special fittings are also available for the two smaller cabinets, so that these may be wall-mounted. If the intention is to place the cabinet away from a wall, it is necessary to order a back panel to cover the back of the cabinet. Mrs Bill is also available as a media bench measuring 1192 mm or 1620 mm long by 300 mm high and 480 mm deep. The media bench has three 55 mm cable holes in the back. A drawer for storing DVDs, CDs, etc. is available as an optional extra. Mrs Bill media bench comes in a choice of eight lacquered finishes.